Known to have one of the largest elk populations around, Colorado elk hunting is an adventure that hunting and outdoor enthusiasts are sure to love. 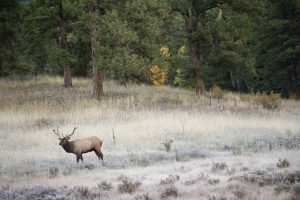 There are many hunting grounds, both public and private, for elk throughout the state that rest in some of the most beautiful landscapes known to man. The terrain can vary greatly, depending on the area one plans to hunt. Open fields as well as wooded areas and beautiful mountains are available where hunters can find just the trophy elk they’ve been dreaming of. Some choose to hunt female elk for food during certain time periods. When opting for Colorado elk hunting, hunters can choose to return to favorite hunting spots or make reservations with a guide service. Many of these services will provide camping gear for a certain number of people, meaning a hunter will only need his or her firearm, bedroll, clothing and food. Hunters are also welcome to stay at the guide service’s lodge, if provided, or in nearby motels. To keep things manageable, many services book only small groups at a time, months in advance. These services also offer advice and tips on what to bring and what not to bring when it comes to Colorado elk hunting. Because this type of tourism is important to the Colorado economy, conservation efforts to keep the elk population in good natural balance have resulted in excellent hunting yields every year. Certain measures make sure full grown bulls and increased herd numbers. The improved chance for a successful hunt is what has made elk hunting in Colorado as popular as it is. Hunters not only enjoy the idea of a successful trip but of finally bagging the 5 or 6 pointer they know is out there waiting for them. Many hunters return year after year not only for the hunt but the beautiful scenery that goes with it. Services that offer Colorado elk hunting can be quite affordable. It is not unheard of for some of these services to offer group rates. Seasoned elk hunters can opt to hunt on private grounds without the use of a guide, making the price of a hunt even less. Many opt to use a guided service that offers all the amenities. These types of services can cost more but also often include the price of licenses and other necessities. Because groups are limited to four to six people in many cases, there is at least one guide for every two hunters. This means getting just the right amount of guidance that results in an excellent outcome for the hunter.